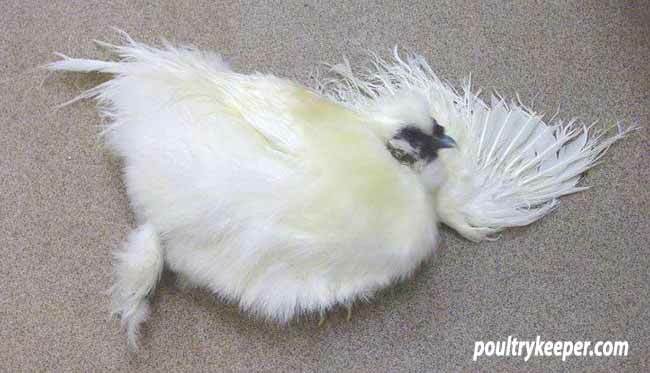 Silkies are unfortunately prone to a few different poultry diseases. In this blog post, Lawrence Beeken provides some information on diseases that he has found are common to the Silkie breed of chicken. Scaly Leg Mite is a parasite common to many silkies, and may be due in part to the leg feathering making them a more attractive option than a clean legged bird. 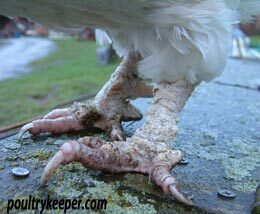 This condition is caused by a microscopic mite that burrows beneath the scales of the legs raising them and producing a crust, which is a mixture of the mites’ excreta and skin flakes, and is incredibly itchy and uncomfortable for the chicken. White salt crusts around the legs. Circulation is impaired and toes may be lost or the foot deformed. For a week or so, soften the crusts with something like Vaseline® , coconut oil or baby oil applied to the scales (although not too much as it may get messy), which will help by soothing and goes some way to suffocating the mites. Then a good soak in something like a dog shampoo or no tears formula and a gentle scrub with a soft toothbrush to loosen the deposits will make the bird feel much better although if blood shows, stop. Lastly, get some surgical spirit and fill a wide necked jam jar to the top, then simply dunk each leg in turn up to the hock and leave immersed for 30 seconds, repeating the process every seven days for a period of three weeks. It may take a while for the legs to look better, often not until the next annual moult, but be assured they will improve. Treat the house with a good poultry mite powder. Oil the perch with something like vegetable oil. As the mite thrive in damp conditions, ensure the house is well ventilated. Old fashioned remedies such as applying creosote or diesel are not to be followed as these remedies are known carcinogens and harmful to both handler and bird. Unfortunately silkies are prone to Marek’s disease, and it has been suggested that the dark eye of the silkie contributes to its susceptibility although this has never been firmly proved. That said, it is still not a common disease and many silkie problems are attributed to it – the only sure diagnosis is post mortem by a veterinary surgeon. A herpes type virus identified by Josef Marek, it infects the lymphoid tissue, commonly causing tumours and damage to the peripheral nerves resulting in paralysis, typically of one wing and one leg. Torticollis (twisted neck, seahorse neck) may be present but should not be confused with water on the brain. Marek’s can affect most of the systems of the body where tumours interfere with normal functioning, e.g. lesions and tumours in blood vessels and the digestive system. Infection is by the inhalation of feather debris as this is where the virus sheds. The virus quickly develops in the body and becomes latent until symptoms appear between four weeks and several months later, usually as a result of stress. Females are more prone due to the stress caused by laying, and the disease often manifests just as the bird comes into lay. Paralysis, with one wing and one leg stick out in opposite directions (see photo above). Antibiotics may reduce certain symptoms such as disorientation, but birds will most likely die or at best become carriers, shedding the virus. Culling is unfortunately the most effective treatment. Vaccination at day old and again at two weeks. Do not keep older birds with younger as the youngsters will pick up any shed virus. The older a bird is before exposure, the greater its chances of resisting as chicks will develop natural resistance from about 5 months of age helping them to overcome later infection. Turkeys can carry a virus that stops the Marek’s virus from producing tumours and keepers will sometimes run their stock with turkeys in order for their birds to pick up this virus, however mixing species is not to be recommended. 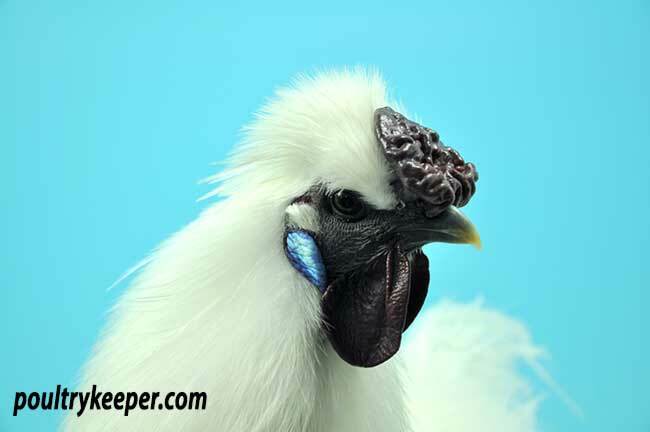 The best silkies are those with a dome on their skull which produces an excellent crest although this is often quite alarming when seen in chicks as it appears as a large bump on top of the head – quite disconcerting to new breeders! It is a particular problem with, although not limited to, some of the crested breeds and is often mistaken for Marek’s disease. An infection in the enlarged cranial cavity produces fluid which in turn presses on the brain. Symptoms include walking backwards and falling over. The bird may spin around in circles then suddenly recover, much to the misguided amusement of the keeper. Treatment is simple and effective: isolate the bird and administer a liquid feed (pellets ground up with water) via a large syringe directly into the mouth at regular (two to four hour) intervals during the day, with the last feed at night. An antibiotic preparation needs to be prescribed by your vet and injected into the breast muscle along with an anti inflammatory drug (ask your vet to show you how if you are unsure) to reduce the swelling and clear up the infection. You may have to continue treatment for up to four weeks in mild cases however severe cases should be euthanized if there is no marked improvement after one week or if the bird is in considerable distress.